You are here: Home / Recipes / Preserving / Can You Freeze Onions? 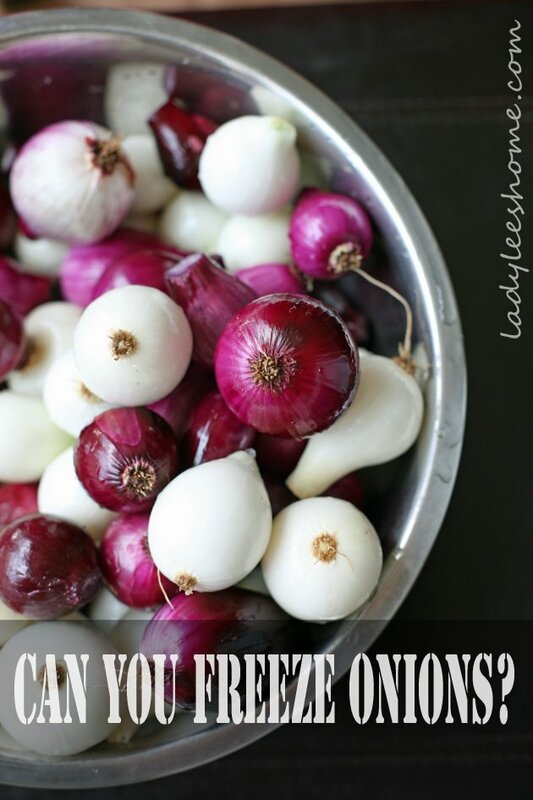 Can you freeze onions? A friend asked me. Yes! You certainly can, and it’s extremely simple. Our onions weren’t huge this year. I simply lost the weed war, and the onions had too much competition. It was also very wet, so some of them rot in the ground before it was time for picking. However, we got many smaller bulbs, mainly white and purple (or red if you rather). So, if you have a large harvest, or if there is a special onion sale someplace (maybe you can buy a large number of onions directly from a local farm), you can dice them and freeze them. This way you always have diced onions in the freezer ready for any dish that calls for onions. First, peel. wash and chop your onions. This is really the hardest part here. Just takes a long time, and involves lots of tears. If you grow onions for the freezer or purchase large amounts on a regular basis, consider purchasing one of those Chop Wizards to make the job faster and easier. Next, you divide and bag the diced onion. No need for blanching like with other vegetables. 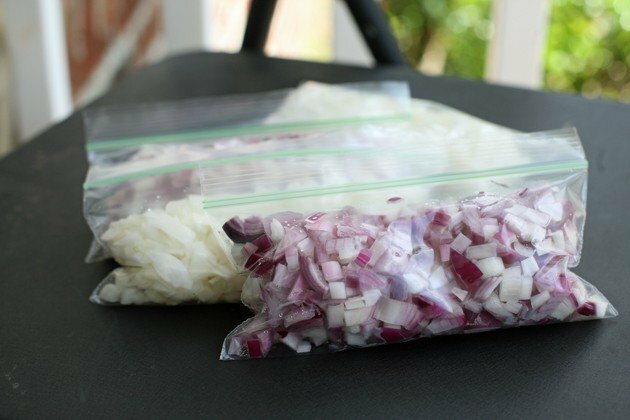 I use small snack size bags and place one cup of diced onion in each bag. It’s better to use the FoodSaver Vacuum Sealing System if you can afford it. That’s pretty much it. 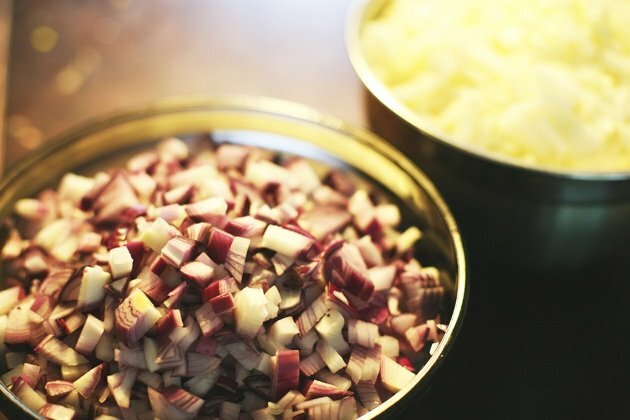 Place the bags in the freezer and when you need diced onions, they are ready for you. You don’t even need to defrost the onions before using them. As a mom of three little ones, those bags saved me a time or two (or 12…). So, to freeze onions simply dice, bag and stick in the freezer. They should be good until next year. Don’t they stink up your freezer? Thanks for the great idea. I’m going to attempt to store my onions out of the freezer, although this is my first year doing it and I am anticipating trouble with the spots I have available. So, if they start to go south on me, I think this would be a wonderful alternative! So, you can’t just freeze them whole? 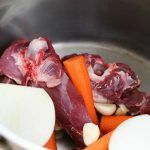 Does freezing change the texture of the chopped onions? I never tried to eat the onion raw after defrosting it, if to be honest… So I am not sure if the texture is different. I usually use it in cooking, so I either caramelize it or add it to stews. I think it’s probably going to be different than when it’s raw. I wouldn’t freeze a whole onion unless you mean to use it whole later. It will just be too hard to handle. If you are going to keep them out of the freezer/refrigerator, try to choose a cool and well ventilated place and to separate them somehow, maybe with newspaper or something. 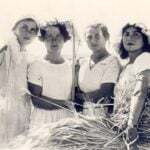 Also, go over your crop every week to make sure nothing is rotten, and if one of them is, remove it right away. Thanks for your detailed response! 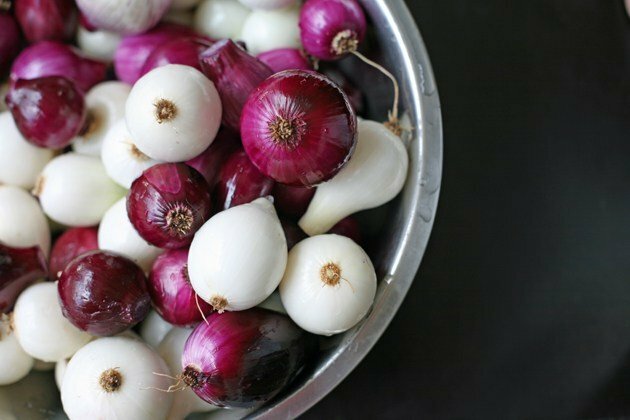 Come to think of it, I don’t know when I ever eat onions raw, so no problem there good point, thanks. Oh and that’s a good tip to check the onions weekly!